In the article “Anne Boleyn’s Coronation Procession” Nasim wrote about the display at Leadenhall where “a castle was constructed, with a ‘heavenly rouse’ at the top whilst red and white roses sprung forth. From this heavenly rose descended a falcon which landed on a stump. To crown with a diadem imperial! For it cometh from God, and not of man. This tableau was full of symblism, as it also consisted of St Anne and the “Three Marys”, and was an expression of the hope of the City “that the pregnant Anne Boleyn would go on to rival the maternal success of her patron saint” 2, but it also introduced Anne Boleyn’s badge – the crowned white falcon holding a sceptre, perched on a tree stump and surrounded by roses. But why did Anne choose this badge? What does it symbolise? So, not only was Anne referring to noble lineage (through the Butlers) but she may also have been saying that she was majestic, powerful, eager and ready to do her job as Queen. 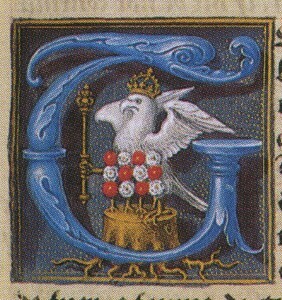 Ives points out that Anne Boleyn’s use of the falcon as her badge was new at this time. When her father had been made Earl of Ormonde, Anne had used a coat of arms (or shield) which showed “her mother’s descent from Edward I and from the earls of Surrey, her father’s earldom of Ormonde and his earlier barony of Rochford, but she continued with the Rochford badge of the black lion rampant. When she became marquis of Pembroke a coronet was added to this achievement and the monogram “AP” adopted, but again no bird.” 4. It seems, according to Ives, that Anne was either granted the badge on her marriage to Henry VIII or chose to use it at this time. Ives writes of how the tree stump or “woodstock” was “a centuries-old royal badge”5 and would have referred to Henry VIII’s right to the throne, but that this combined with the falcon landing on it and roses bursting forth spoke clearly of life bursting forth “from the barrenness of the Tudor stock.” 6 Anne saw herself as the one who would give Henry his longed for son and continue the Tudor line. 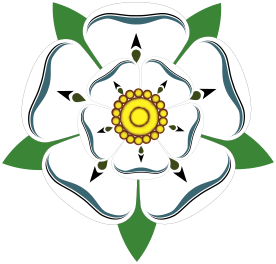 The roses on Anne Boleyn’s badge are not the Tudor rose but rather the red rose of Lancaster and the white rose of York and Ives writes of how this is also referring to Henry VIII’s right to the throne of England, through his father Henry Tudor, Earl of Richmond (a Lancastrian), and his mother Elizabeth of York. Henry VIII brought the claims of the Lancastrian and Yorkists together. Anne Boleyn’s white falcon is holding a sceptre which, Ives is quick to point out, not only refers to Henry and Anne being king and queen, but is also a symbol of God-given authority. Now may this falcon white. God grant her most of might! In the second verse above, Ives writes of how Udall is no doubt referring to “papal obstructiveness” and the way that justice had now been done, through Henry’s break with Rome, and Ives also points out that the description of the falcon in verse one could also be used to describe Anne herself. Ormonde obviously refers to the Boleyn’s links with the Butlers and Thomas Boleyn being Earl of Ormonde, and Rochford refers to the Rochford title which was given to Anne’s father in 1525 and to her brother in 1529, but what about the others? Brotherton – Thomas Brotherton (1300-1338) was the first Duke of Norfolk, and Elizabeth Boleyn (née Howard) was descended from him. 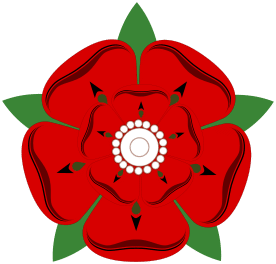 Lancaster – The Lancaster bit could refer to Henry VIII’s Lancastrian roots and Anne’s links to the Plantagenets through her mother, who was descended from Edward I.
Angoulême – This could refer to Anne’s intimacy with Marguerite of Angoulême, a woman who, according to Ives, Anne saw as a royal role model. See also below, in the Warenne section, for the Warenne/Plantagenet/Angoulême links. Guienne – Guienne or Guyenne is now known as Aquitaine and is a region of France known for Eleanor of Aquitaine (wife of Louis VII of France and then Henry II of England, the Plantagenet king) and being a Protestant Huguenot stronghold. Katherine Swynford, third wife of John of Gaunt, had the maiden name of Katherine de Roet de Guienne and John of Gaunt was the Duke of Aquitaine, as well as being Duke of Lancaster, son of Edward III and member of the House of Plantagenet. Henry VIII’s grandmother, Margaret Beaufort, was descended from John of Gaunt and Katherine Swynford and Anne Boleyn could trace her family (through her mother) back to Edward I, John of Gaunt’s great-grandfather. Warenne – This must refer to the House of Warenne, an Anglo-Norman house whose name came from the the town and river of Varenne in Normandy, France. The first Earl of Warenne or Warren was William de Warren who was also the first Earl of Surrey during the reign of King William II. In 1163, the widow of William de Blois, who was the 4th Countess of Warren and Surrey, married Hameline Plantagenet, half-brother of Henry II. 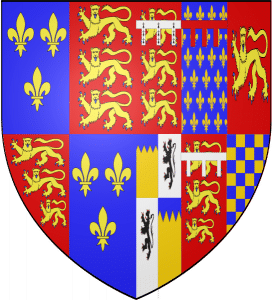 Hameline became the 5th Earl of Warren and Surrey and it was at this point that the Warren title became part of the inheritance of the House of Plantagenet (or Anjou). The wikipedia page on the House of Warenne is rather complicated but it does mention a John de Warren who, in 1247, married to the daughter of Hugh de Lusignan (Earl of March and Angoulême) and Isabelle d’Angoulême, widow of King John and the mother of Henry III who was father of Edward I. My brain is somewhat exploding at this point but there is obviously a link between the House of Warenne, the Angoulêmes, the title of Earl of Surrey (which was inherited by the Howard family) and the Plantagenets. There does seem to be a link here between Anne Boleyn, who can trace her family, through her mother, back to Edward I, and Henry VIII who also had Plantagenet roots. Is your head exploding yet? I may have gone off on a complete tangent here and got it all completely wrong so please do correct me if you find anything out about these families and house, but it is rather interesting isn’t it? 1 – Ballads from Manuscript, ed. F. J. Furnivall. Ballad Society (1868-1872) p389 quoted in The Life and Death of Anne Boleyn, Eric Ives 2004. 2 – The Life and Death of Anne Boleyn, Eric Ives (2004), p220. 4 – The Life and Death of Anne Boleyn, Eric Ives (2004), p221. 5 – The Life and Death of Anne Boleyn, Eric Ives (2004), p221. 6 – The Life and Death of Anne Boleyn, Eric Ives (2004), p221. 7 – The Life and Death of Anne Boleyn, Eric Ives (2004), p222. 8 – Ballads from Manuscript, ed. F. J. Furnivall. Ballad Society (1868-1872) p390-391 quoted in The Life and Death of Anne Boleyn, Eric Ives 2004. 9 – The Life and Death of Anne Boleyn, Eric Ives (2004), p398. 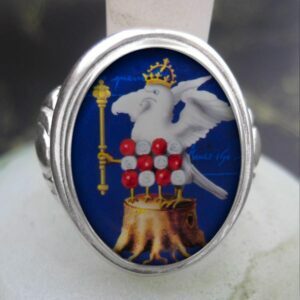 We have a range of sterling silver products featuring Anne Boleyn’s falcon badge – see our Falcon Badge Products page for more information. Question: There’s a scene in an episode of The Tudors where George (I think it was him) draws a picture of a Falcon swooping down to pick up a pomegrante & shows it to Anne. Does anyone know if that actually happened? I just thought it was an interesting scene that showed the rivalry between Anne and Katherine during the divorce process. The white falcon on Erin’s punchneedle wallhanging matches the falcon in the badge from Nasim’s photo of the badge from a copy of Clément Marot’s Le Pastor evangélique, which was probably presented to Anne by the French ambassador during the coronation festivities – http://www.flickr.com/photos/20631910@N03/4466300545/in/set-72157623587965011/ – but if you do a Google search there are pictures of the falcon in both positions. Here is a link to a page from a music book owned by Anne that has at the top of the page a picture of a falcon pecking at a pomegranate. It’s on little_miss_sunnydale’s flickr account. but the falcon 6 legs. what are they for? 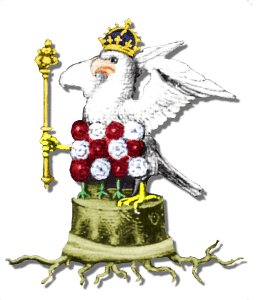 Anne’s falcon has two, but the roses, which symbolise the issue (children) of Anne and Henry, also have legs. The roses symbolise the children to come.